In 1996 Samaneri Dhammadinna became the first woman from Thailand to travel to Sri Lanka to become a 10 precept nun, a Dasa Sila Mata. 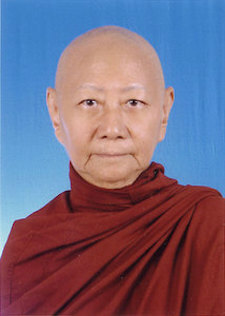 Before devoting her life to religion, Samaneri Dhammadinna served as a nurse in Thailand , Taiwan and Italy . Then she returned to her homeland of Thailand , and dedicated her life to promoting the Dhamma at Suan Mok with Bhikkhu Buddhatat. She enjoys creating fabric art, meditating, and chanting. She has dedicated her life to interfaith peace and dialogue. In 2004 she ordained as a Samaneri and is now studying for Bhikkhuni ordination. She intends to travel to Sri Lanka again. This time at the age of 73.